New England is probably not the first place that comes to mind when you think of dinosaurs, yet some of the first dinosaur remains in the United States were found here in the 19th century, mostly in the form of footprints. Since 2010, Jurassic Roadshow has brought the science, history, and art of the Connecticut River Valley’s dinosaur footprints and trace impressions to street fairs, community events, libraries, and even such venues as a local bank. Most of the footprints are 3-toed, birdlike tracks in the sandstone of the valley floor, often found along the river banks and under the water. This gives many people the mistaken impression that dinosaurs once walked along the banks of the Connecticut River. This is not the case. When dinosaurs roamed the region approximately 200 million years ago, the river did not exist, but there was a shallow sea where the animals came to drink, eat fish, and perhaps cool off. For centuries, maybe even thousands of years, Native people speculated on the origin of the tracks, but unfortunately, most of their thoughts are lost to us today. European colonists may have seen the impressions, too, but the first known thorough scientific investigation began in 1835 in a Massachusetts section of the valley, a few years before anyone knew what a dinosaur was, and there wasn’t even a word for it. Several discovers of the “fossil bird tracks” have left their own traces for us to interpret, some leaving lots of evidence in great detail, others only a tantalizing smattering of bits and pieces. This website focuses mainly on two things: the activities of Jurassic Roadshow and the larger Impressions from a Lost World website. Jurassic Roadshow shifts its shape to fit each town and venue. Our collectors exhibit a range of local trace fossils, from dinosaur tracks to insect trails, mud cracks, raindrop impressions, and more. We usually have a microscope on hand, too, for visitors to look through, and sometimes have costumed historical interpreters who talk about their 19th-century experiences with geology and fossils. Art, poetry, music, and other activities connect to each town’s local character and connection to the geology and discovery of the dinosaur tracks. 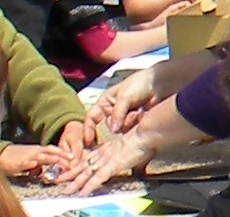 When we can, we also offer a talk or demonstration by a paleontologist, historian, writer, musician, or artist. Impressions from a Lost World is a large, intricately knit site about Edward and Orra White Hitchcock and the 19th-century discovery of dinosaur footprints in the Connecticut River Valley. Six stories and seven thematic essays give the site coherence, but you can approach the content in a number of ways, and you can skim or dig pretty deep. There are brief introductions to the people involved; artifacts and original documents to let you see the history for yourself; background information on the historical circumstances of the discovery and the state of geological science at the time; videos, slideshows, and interactive activities about paleontology; and even a map that helps you plan a dinosaur-footprint-focused trip to the region. Jurassic Roadshow is a project of Pocumtuck Valley Memorial Association (Deerfield), funded in part by a John and Abigail Adams Grant from the Massachusetts Cultural Council. Impressions from a Lost World was created under grants from the National Endowment for the Humanities (NEH) and the Institute for Museum and Library Services (IMLS). Photos by Sarah Doyle. Impressions from a Lost World illustration by Monica Vachula.